Superior air charter service for those individuals who can afford to leave the fluctuating schedules, delayed flights, crowded terminals, and lost baggage behind. JET EXPRESS executive chartered flights allow you to make the most of your business trip, your weekend, or your family vacation because they buy you time that you would otherwise spend waiting in line, on the telephone, or driving to a large airport. Affordable air charter service for larger groups, that allows you to make the most of your company function, your team's sporting event, or your organization's tour. 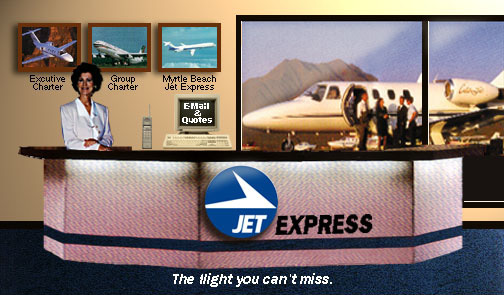 JET EXPRESS operates on your schedule. Speed, service and security 24 hours a day, 356 days a year. With JET EXPRESS chartered service your flight is tailored to accommodate your schedule and the exact number of passengers you need to move. Thousands of airports are accessible for your convenience, which enables you to fly direct to your destination almost anytime, anywhere. JET EXPRESS operates under the authority of Management Air Transportation Services Inc., FAA Air Carrier #AMPA-168C. We have ten years of accident and violation free flying history. If we cannot accommodate you in our aircraft, we will be happy to make all of your arrangements with one of our affiliated air carriers.